FREE SHIPPING: For a limited time. 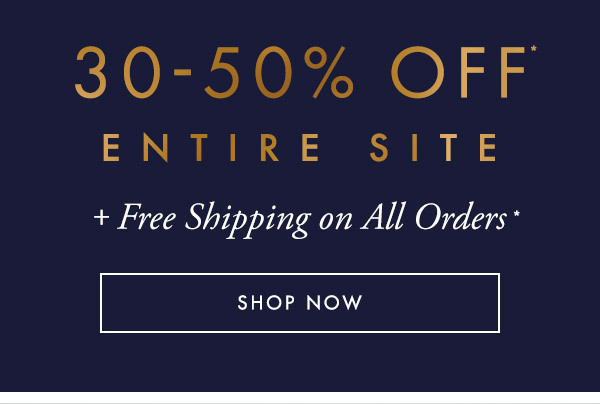 Offer valid ONLINE ONLY at GUESS.ca. Must select "Standard 5-7 Business Days" on the shipping page to receive this offer. Shipping offer applies to standard ground shipping within Canada only. Shipping discount will be reflected on the Payment Page. Offer cannot be combined with other shopping promotions or discounts. Offer not valid on purchases of gift cards or previously purchased merchandise. Offer not valid at GUESS, Marciano, G by GUESS or GUESS Factory stores, or at Marciano.com, ShopMarciano.ca, GbyGUESS.com, GbyGUESS.ca, GUESSFactory.com or GUESSFactory.ca. Cannot be combined with other offers or discounts. GUESS?, Inc. reserves the right to extend, modify or discontinue this offer at any time without notice. SALE: Limited time only. Prices shown online reflect all discounts. No additional discount will be taken at online checkout. Some sizes and colors may not be included. Quantities limited. Prices online and in-store may vary. Offer excludes special collections and collaborations, Gc timepieces, previously purchased merchandise, e-gift card and gift card purchases. Other exclusions may apply. Offer not valid at GUESS, Marciano, G by GUESS or GUESS Factory stores, or at Marciano.com, ShopMarciano.ca, GbyGUESS.com, GbyGUESS.ca, GUESSFactory.com or GUESSFactory.ca. Cannot be combined with other offers or discounts. GUESS?, Inc. reserves the right to extend, modify or discontinue this offer at any time without notice. PAJAMA SET: Offer valid online only while supplies last. The value of your transaction must total $125 CAD or greater after discounts, before taxes to receive this offer. Item will reflect in shopping bag at online checkout with option to select a size. Customer pays $29.00 CAD for Pajama Set and updated merchandise total will reflect at online checkout. Certain restrictions apply. Limit one Pajama Set per customer. Void where prohibited. Offer not valid on previously purchased merchandise or purchase of gift cards. 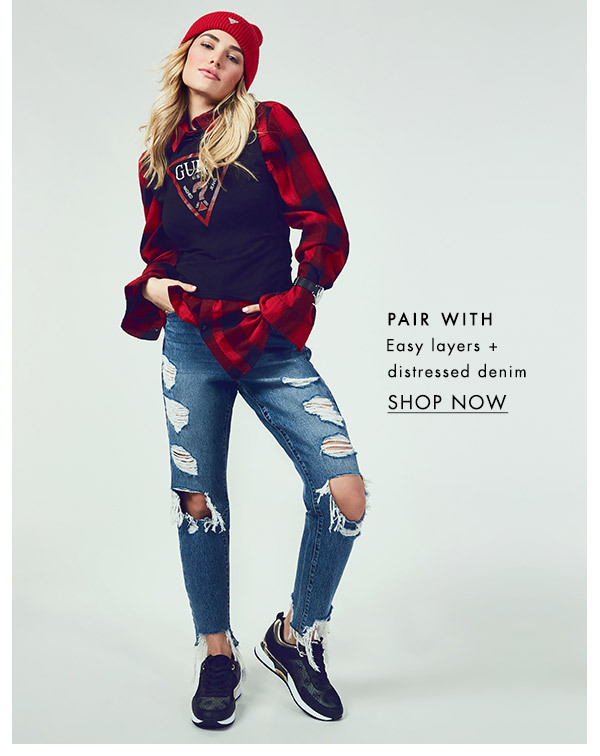 Offer not valid at GUESS Factory stores, or at GUESS, GUESS Accessories, G by GUESS, or Marciano stores or their affiliated websites. GUESS?, Inc. reserves the right to extend, modify or discontinue this offer at any time without notice. 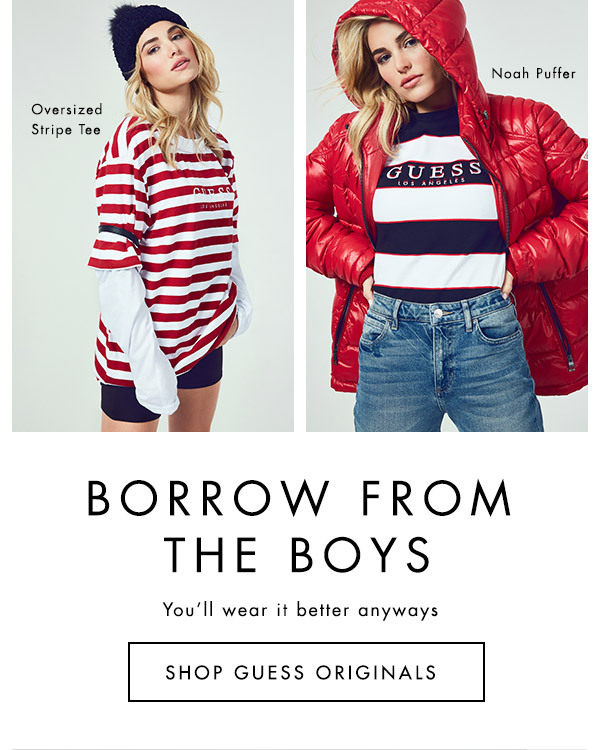 Offer not valid for employees of GUESS?, Inc.
To ensure you always receive emails from GUESS, including the latest styles and exclusive events, add GUESS-Canada@em.guess.com to your address book.